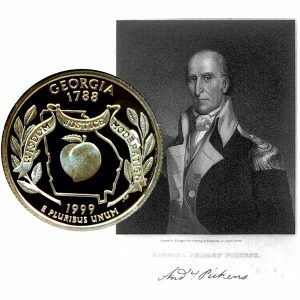 Today, the Georgia State Quarter Coin remembers when General Pickens convinced the Indians to be peaceful and not support the British with a treaty signed October 17, 1782. When the limits of the British regulars were contracted, a number of those who adhered to the royal cause, were unwilling to be confined to a garrisoned sea-port town. General Clarke imagined that they could render him essential services, by retiring to the Cherokee nation. At the head of this clan was colonel Thomas Waters, who had formed a settlement on Hightower river, at the mouth of Long swamp creek, where himself and party had collected a number of negroes, horses, cattle, and other property, which they had plundered from the frontiers of Georgia and Carolina. General Pickens made application to the governor of South Carolina, to carry another expedition into the Cherokee nation, to route this banditti and punish the Indians. Pickens’ plan being approved of by the governor of Carolina, he sent an express to colonel Elijah Clarke, of Georgia, on the 5th of September, requesting the aid of part of his regiment, and fixed on the 16th, at Long creek, in Wilkes county, as the time and place of rendezvous, with thirty days provision. General Pickens’ command consisted of three hundred and sixteen, and Clarke’s of ninety-eight, including ten volunteers from Richmond county; making in the whole four hundred and fourteen, including the officers. The general marched on the morning of the 19th in a western direction for the Chattahoochie river, which he reached and crossed on the 24th, at Beaver shoal. Pursuing their course on a small Indian trail, they met two Indians, who were taken prisoners. The information received from them was, that there were several Indian towns within the distance of ten or twelve miles, and from thence colonel Waters’ party was about twenty miles. The general detached colonel Robert Anderson with one hundred men, piloted by one of the Indian prisoners, to destroy the villages and towns upon the river. Colonel White was ordered down the river, with a detachment, for a similar purpose, while the general and colonel Clarke took a more direct course for colonel Waters’ rendezvous, the destruction of which was the principal object of the expedition; but Waters’ spies had discovered the army on the march, and gave him notice just in time to escape with his party. A few Indians were killed, and a number of women and children were taken prisoners. Anderson and White joined the main body in the afternoon, having killed eight Indians and destroyed a number of towns. General Pickens sent out some of his prisoners in search of the chiefs, offering the olive branch, with assurances that no more of their towns should be destroyed, if they would surrender the white people among them, and enter into a treaty of peace. In the mean time the general marched from one town to another, to procure supplies of provisions and forage for his army. Several of the chiefs met in the mountains and sent one of their principal head men, called the Terrapin, with a party of warriors, and six of Waters’ men prisoners; promising that every exertion should be made to take and bring in the others; acknowledging that these white men had occasioned the killing of their people, and the burning of their towns. On the 8th of October, colonel Clarke marched from Selacoa, with one hundred men, in pursuit of Waters, who had halted on the Estanala river, about sixty miles west of Long swamp; but Waters hearing of his advance, retreated through the Creek nation to St. Augustine. On the same day, captain Maxwell’s company marched to Estanala town, where he took twenty-four negroes, the principal part of whom had been plundered by Waters’ party from the inhabitants of Georgia and Carolina, a number of horses, and a quantity of peltry, with which he returned on the seventh day. A number of the chiefs came in, and proposed to general Pickens, while he was at Selacoa, to hold a treaty at Long swamp, on the 17th, to which he agreed. On the day appointed, twelve chiefs and two hundred warriors appeared, and entered into temporary articles of treaty, which were afterwards to be confirmed by the whole nation, at such time and place as the governor of Georgia should appoint. By this treaty, all the lands claimed by the Cherokees south of Savannah river, and east of the Chattahoochie, were to be surrendered to the state of Georgia, as the price of peace. The Indian trade was to be opened upon terms not less advantageous to the Indians, than that which had previously been carried on between them and the British government. These articles being signed by both parties, general Pickens returned to his former rendezvous, on Long creek, where the troops were discharged on the 22nd of October, and returned to their homes without the loss of one man. The general’s whole command, could not produce a tent or any other description of camp equipage. After the small portion of bread, which they could carry in their saddlebags, was exhausted, they lived upon parched corn, potatoes, peas, and beef without salt, which they collected in the Indian towns. The Georgia State Quarter Coin shows with an image of General Andrew Pickens, circa 1820.